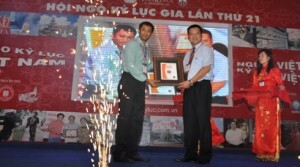 On October 30, 2011, Asia Book of Records collaborated with Vietnam Book Centre at HCMC in Vietnam. The collaboration will include record search from Vietnam, Laos and Cambodia. On this occasion, editoring Chief of Asia Book of Records center gives the certificate for Le Tran Troung An- general director of Vietkings. Comments for Asia Book of Records collaborated with Vietnam Book Centre are now closed.